@Storm Calling: I especially adore the Yukio issue..........I honestly love whenever Claremont goes into detail with how her powers work. She's not saying that she can't overrun the currents. She was just overwhelmed at that particular moment, and weakened. Indeed, thanks for pointing that out considering people may have got the impression that she was having difficulty because of her manipulating the water. This was shortly after a brawl with Yukio and them diving into the ocean and getting hit with a powerful crushing wave. It was also actually the first time she had to deal with the "Liquid Atmosphere", so it's essentially why it seemed like a new experience to her. @White Mage: @Storm Calling: I just love that 2nd GIF >:-). It cracked me the hell up the first time I saw it. Thanks for the clafirication. I have read both the scans and your explanation several times to make sure I understood what you meant. And for the operative word is harder. Its not to say she couldn't manipulate that body of water but it would be harder. So my question would be this, lets say she held in her hand a cup of water, would she be able to manipulate this? And why wasn't she able to fight against the fan that created the winds? I understand its not natural wind, but the effect is still the same same correct? @butterflykyss: I thin she can counter, redriect or cancel out a wind based attack. In this instance she could have fought against the fan's wind if had she had the time. It hit so fast that she didn't have time to counter it and she was painfully belly-flopped into the water IIRC. There was another instance from her early days where she stated on panel that she could have countered a wind-blast from a Danger Room automaton but didn't have the time, and an actual instance her overpowering Hurricane (a wind manipulator) and can cancelling his control over the wind. Your question about the cup of water is very interesting to me if I am understanding you correctly. Can she do what she did to Hydro-Man or what she did in XXM when she altered the state of the water? Then yes she can. She has changed the stated of water several times (at least 3 times I believe) on panel. Can she animate the water in a cup like a Hydrokinetic? I have not seen her do this with an existing body of water to prove that she can, so I would say no. She has shaped the moisture in the air and clouds to create a water lense and make a face in the clouds but animating it is different (like making a water golem or water hammer) and I have not seen Storm do that. Can she generate a current in a cup of water? Not sure. I wold think theat there is not enough water to do it. In general though, I think that would depend on the volume of available water and I have only mainly see her do that while being fully submerged in the water, with the exception being in the scans of her creating a tidal wave to take out those guys who had come to kill Wolverine. In those scans she created the tidal waves without using wind and not being in the water directly herself. It's an aspect of her powerst I would like to see explored more. I don't think she'd be able to water-bend it. I feel that her control over water is very unrefined, and more...."violent", if you will. In general, I think that she goes more to "current control" with water vs. direct psionic control.....I don't think I'll ever see her pull an Iceman with a cup of water. I think I should first try to explain exactly why it would be harder for her to manipulate the water, especially in a situation like the one Phoenixofthetides provided. Considering the fact that it's not a natural body of water, or even a body of water at all(it's basically a room that's being pumped full of water), Storm would have trouble redistributing the water somewhere else simply because it's a controlled environment by itself. There's not much you can do with the water unless you force it back where it came from or freeze it(Or change it's state into a gas). In both cases, Arcade's technology probably would have prevented Storm from doing both by emitting a stronger force to push the water into the room or had heaters to prevent her from freezing it(much like how he used a stronger wind current to negate her ability to fly or used a stronger electrical field to counter her lightning in the scan provided). In a natural body of water, she has proven that she can manipulate water to the same degree as she does air "I can't manipulate it as casually as I do air, but it is possible". I'd also like to point out that she was able to fight the fan, but it wasn't as easy as pie, considering it wasn't a natural wind draft that was being produced. I think I should first try to explain exactly why it would be harder for her to manipulate the water, especially in a situation like the one Phoenixofthetides provided. Considering the fact that it's not a natural body of water, or even a body of water at all(it's basically a room that's being pumped full of water), Storm would have trouble redistributing the water somewhere else simply because it's controlled environment by itself. There's not much you can do with the water unless you force it back where it came from or freeze it(Or change it's state into a gas). In both cases, Arcade's technology probably would have prevented Storm from doing both by emitting a stronger force to push the water into the room or had heaters to prevent her from freezing it(much like how he used a stronger wind current to negate her ability to fly or used a stronger electrical field to counter her lightning in the scan provided). In a natural body of water, she has proven that she can manipulate water to the same degree as she does air "I can't manipulate it as casually as I do air, but it is possible". I'd also like to point out that she was able to fight the fan, but it wasn't as easy as pie, consideringit wasn't a natural wind draft that was being produced. @White Mage: @THUNDERBOLT30: I think it should be within her control to animate water. We have seen her do so with clouds(Which is water), tornadoes, and lightning. I don't see anything that would prevent her from doing it other than it requiring her to emit more psionic control and willpower to manipulate an element that heavy. Agreed. I do want to see her explore powers more while in a body of water. I liked the potential uses of the air pressure dome (what about the pressures in the depths of the ocean? ), trans atlantic current being used like a jetstream for fast travel underwater, generating tidal waves, and since she can sense the moon's pull on the tides and it's influence on ocean activity how would that play into her manipulation of the ocean atmosphere? I think these are the instances that show that her mastery of her powers is more than just generating storms and exotic weather effects, but clarifies that her main controlling the forces behind weather phenomena as a whole and how these abilties adjust to the atmosphere she is in. Man....Great thread. Storm is a beast! Ok this makes a little more sense to me.. thanks to you both for the explanation. And to the point about manipulating the water I was speaking more to how a hydrokinetic would. She can manipulate gases (H2O) which is a less dense version of water, it would seem to me that she should be able to do the same but would just require more exertion on her part to do so. Much like with the tidal wave scan.. It is something that I would like to see explored because I definitely agree it appears it would be within her powerset to do. I think generally the consensus is that we haven't seen her do it, so we assume that she can't; Which I agree, considering it helps us to differentiate between what she can do and cannot do. However, we have seen her animate her effects in the past but it has never been often(we can probably count on one hand how many times she has been shown animating anything with her powers). Speaking generally on the fact that she has been shown controlling all three components of water(hydrogen atoms, air molecules, and electrons), and the fact that she has been shown shaping water droplets, I think it is safe to assume that it should be within her power to animate water. It may be more difficult, which is probably why we never see her do it, or maybe she just doesn't like making faces with her powers like Iceman does, and would rather take the natural approach(leaning more towards the latter). This is how I see it. Most likely she can do it, but it would more than likely require more strength for her to pull off the feat, considering she's not using any secondary effects to produce it, like an updraft or some sort of wind current. Oxygen, Hydrogen, and Electron gases are practically weightless compared to water, and would require something that is pure psionic/telekinetic in the way that we are talking about controlling it. So I find that it would probably be much harder for her to do this with an element like water, but not impossible, considering what she has been able to do. Thanks for clarifying the innatrual wind effect. My a$$ could not recall that accurately to save my life lol. It makes sense to me that she should be able to. I don't think she HAS to be a full on hydrokinetic to animate the elements that fall under her purview the same way a Hydrokinetic can. Maintaining a strong enough psionic control of these forces once she has shaped them so she can control it's movement should be well within her powers. The example of her creating a water lense and maintaining control of the moisture to shape it in a way to filter in only the correct energy to fuel Cyclop's powers supports that, as well as her making that angry face in the clouds to scare that slave-trader. Sorry that I did not correctly recall the instance with the wind attack correctly. She actually was able to defend against it with her own counter updraft. I think she belly-flopped at some point in that issue from something lol. I fully agree on the need for more exploration of her powers. Her powers are so unique in the way they work,which is why I can see how it can be confusing. The interesting comparison I find is between characters like Crystal and Ororo. Very different powers but have quite a few overlapping similarites. Crystal doesn't really control energy the way Storm does but she can to a certain degree (i.e. - like creating seismic beams, can manipulate existing electricity or tapping into the EM field to alter gravity). She primarily uses her control over the physical matter of the elements more so then we see her generating energy. With Storm it is the opposite. She has instances of showing direct control over the elements (like with Hydro-Man, removing the air from the lungs and pullling free-floating hydrogen atoms to her), though she primary indirectly controls them by manipulating the energy forces behind weather phenomena and their respective elements, such as water (like tidal energy). I remember seeing a CV poster stating that he did not like her powers but I'm like....when you see interesting aspects to this powerset (not like Thor's magical storms but actually controlling the energy forces behind the scene) how could you not like it? I guess it's the nerd in me who watched way too much Captain Planet when I was younger because I have only mainly had interest in characters who control/manipulate elements. @THUNDERBOLT30: Excellent breakdown, I think the comparison with Crystal and Thor is a great way to explain how Storm actually utilizes her powers. She does in fact typically manipulates the energy systems behind weather to produce physical forces as a secondary effect, such as convection, pressure differentials, and temperature, or even local patterns(that is exactly how she manipulated the water/ocean currents and many of her wind based effects as Sage explained in the scans provided on the previous), but as you said, she has also proven that she can manipulate many of the forces directly/telekinetically(This is where that one poster who said she could only directly controls wind came into conflict). Which is why I see it within the scope of her abilities to do something like this, even though she hasn't outright shown that she can(I still feel that she has already proven that she can in a way). Also, you did recall the issue correctly. She did in fact get blown into the water at one point and was unable to resist it. I was merely providing the one where she countered it as proof that it is within her power to resist and fight it, if she were willing and able. Exactly, and this is why we don't see her do as many things that should be within the purview of her powers. There are always easier ways for her to produce an effect instead of doing so directly. Why exert energy into water-bending out of a sink or a bathtub or a filthy toilet or a pouch when you can pull the water out of the air and produce your own? Why waste energy trying to create a wave by directly controlling the water molecules when you can just manipulate the forces behind the wave to produce your own, which will most likely be far more effective anyway? Or why waste time trying to create a water hammer or compressing water into an object when you can toss an instant flash flood of water at someone or hit them with lightning or winds? It's typically the same with her winds and ice ability. I still wounder how she was able to surf on water without a board. lol I think this had something to do with her ability to manipulate water. Exactly, and this is why we don't see her do as many things that should be within the purview of her powers. There are always easier ways for her to produce an effect instead of doing so directly. Why exert energy into water-bending out of a sink or a bathtub or a filthy toilet or a pouch when you can pull the water out of the air and produce your own? Why waste energy trying to create a wave by directly controlling the water molecules when you can just manipulate the forces behind the wave to produce your own, which will most likely be far more effective anyway? Or why waste time trying to create a water hammer or compressing water into an object when you can toss an instant flash flood of water at someone? It's typically the same with her winds and ice ability. surfing without a surf,... awesome! @White Mage: You're right, I doubt it as well, especially considering most writers prefer her to just shoot lightning. We have a long way to go for writers to get back to being more creative with her powers, especially to that degree. has Wood been creative in using Storm''s powers? So far, it seems like they do! I have been waiting for this to happen. I want her factor in her veteran combat experience and knowledge change up her attack approach. I wish her wind/air manipulation got used more. Concentrated blasts of winds from unexpected angles (like those precision hurricane winds she used to KO DeRuyter's thugs tryingto kidnap T'Challa pre retcon -__-), beam of compressed air blasts like in XXM, katabatic wind beams, blizzard beam, beaming a micro-tornado, uber amped microbursts to take out large crowds, or manipulating the air around a target for a fast updraft/downdraft slam can be very effective forms of attack and makes less predcitable to people she has faced more than once. Her air manipulation can be quite versatile and had been used so creatively in the past. Of all the forces at her command wind is definitely my favorite. I want Humphries to tap in to that "dark b*tch" side of her and unleash 3 F5 tornadoes to decimate a huge group of targets, an amped katabatic wind beam at cat 5 hurricane strength to instant freeze and shatter a target into pieces, a jetstream wind blast (real world jetstreams can exceed 400mph) to shred a target, or pummel a battlefield with basket ball sized hailstones in 300 mph winds, and a lot more atmospheric pressure manipulation. When Humphries said that pendulum is swinging over to the "down and dirty" for Ororo I want to see showing just how dirty she can really be. Even though I want more showings with wind I won't shy away from some more high intensity lightning bolts that can hurt 100 tonners :-). I also want to see Storm access weather extremes that are no longer natural to the planet's current weather systems, but WERE natural to the planet 1,000,000+ years ago. Like if there were natural -250 degree blizzards back toward the planet's infancy (even though the earth is much much older than a million years), allow Storm to create powerful storms with these kind of prehistoric extremes. Her being able to surf on water without a surf board is most likely due to her being able to manipulate the water molecules' cohesional forces allowing the water's surface tension to be strong enough to resist the forces exerted on its surface due to her weight/gravity. I would imagine it would have been similar to when she manipulated the water molecules in the clouds to create the lens that allowed the correct wavelength of light to be for use by cyke. @THUNDERBOLT30: Great suggestions and ideas, TB. You should be sending this stuff to Wood, Aaron, and Humphries. Soooo tempted at times. I get the feeiing that the writers would take as more of a "fan service" request vs tossing out ideas to inspire creativity. Thanks. All of this crazy power talk hasn't scared you I hope. The Storm fanboy can go all day on that subject :-P.
Oh no never!!! In fact I want more! I tagged u in a link over a CBR go check it out and respond if you can!!! LOL, yes, ALL day long. hey i tagged u in a link to questions brian wood was taking about his new all women book.. go check it out if you can. @Storm Calling: Well, the scan I posted isn't really out of context, because your first scan (very good find BTW!) basically does confirm what I stated in a situation where she is in a natural body of water and she literally stated that it is more difficult to manipulate a heavier medium than air and this affected the ease of using her powers ("There are currents in water as there are in the sky. But the medium is much more dense. I can't manipulate it as casually as I do the air...but it is possible.") I always thought that this was why it was so difficult for her to fight on the moon - she was trying to make weather phenomena that weren't as easily created in space versus trying to learn the phenomena she was capable of in the moon's low gravity environment. The other scans look more as if she using air to create pressure systems in the water to make it a bit easier to manipulate. Going back to the Murderworld scene, though, I think most of the ways Arcade neutralized her powers was by flooding the environment limiting her ability to fly and insulating the cell so that lightning would be less effective. 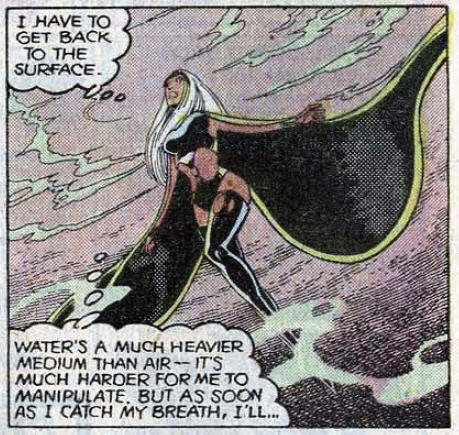 I think this is an overall limitation that she has learned to work around - even in the later scans, it takes her a minute or five to catch her breath and remind herself that she would have to manipulate the environment underwater a bit differently. Maybe because she's so used to working above-ground where air and the atmosphere is so readily accessible. I'm not quite sure I understand this. Water is composed of hydrogen and oxygen molecules. Based on Henry's law there may be some dissolved nitrogen in the water due to the partial pressure of nitrogen, but I would assume there would be trace amounts of nitrogen. At any rate, it wouldn't be considered air as I think you are describing it. From the scans and even from the text, it appears she is harnessing the forces (pressure gradients) used to create the water currents and manipulating them to create the mechanism that would allow her to "ride the water" or "fly" under water, akin to how she uses these similar forces to "ride the wind" or "fly" in the sky. I think the main problem here with your argument is that you aren't considering the fact that water is a different element than air. So essentially, it doesn't work quite the same. It's not that water is harder for her to manipulate, it's that in certain situations she would find air more useful than water and vice verse. Would you say that she controls electricity easier than she controls air, simply because she'd find it more useful in more situations than the other? What I interpreted from the scans was that it would be harder for her to produce the same effects as she can with air with her control over water, but in situations where water is her only element, she has shown that she can manipulate water to the same degree and just as easily as she would with air. Now, you indicated that it would be more difficult for her to manipulate the weather fields/mediums of water compared to an air medium/atmosphere, by providing a scan of her where she wasn't even IN an atmospheric medium pertaining to water at all. I say it's out of context, because it doesn't really endorse the fact that she can't utilize her control over water to the same degree that I proved that she could under an actual water medium. In fact, I proved that she can be just as effective underwater as on land, which your argument suggest that she couldn't. Your scan just proves that Storm is limited by the resources that is available for her to manipulate, which I have in fact went over in the OP in my Mediums/Atmospheres section. It may be less easy for her to produce the same effects with a different element than another, but that doesn't mean she controls the element any less than another. I hope that clears up what I mean.